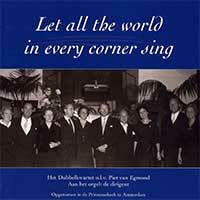 ‘Let all the world in every corner sing’ – Het Dubbelkwartet o.l.v. Piet van Egmond. Aan het orgel: de dirigent. Let the vast universe (F.W. Peace); Dear Lord and Father of Mankind (C.H.H. Parry); Let all the world in every corner sing (C.S. Lang); Blessed are the pure in heart (C.H. Kitson); Sweet is the work (R. Walker Robson); orgelsolo: Evening Prayer (H. Smart); Lord, I have loved the habitation of thy house (G.W. Torrance); Immortal, invisible God (I. Davies); O Worship the Lord (A. Hollins); Rejoice in the Lord (G. Elvey); Oh for a closer walk with God (M.B. Foster); Lord, be thy word my rule (J. Wood); orgelsolo: Postlude on ‘Laudate Dominum’ (E. Matthews); God so loved the world (J. Stainer); Who shall roll us away the stone (G.W. Torrance); Save us, o Lord (E.C. Bairstow); O praise God in his holiness (J. Weldon); orgelsolo: Postlude in C major (H. Smart). Archiefopnamen 1962-1969, opgenomen in de Prinsessekerk te Amsterdam. Ars Audio 04101. Engelse anthems door het Dubbelkwartet olv Piet van Egmond, met drie orgelsoli op het orgel van de Prinsessekerk te Amsterdam. Te bestellen door overmaking van 16 euro op Postbank nr. 51 61 151 t.n.v. Stichting Piet van Egmond Documentatiecentrum te IJLST, m.v.v. eigen adres en ‘CD Dubbelkwartet’.